Growing up I always looked forward to the “pink trees” and the days when the wind would blow the petals down onto the ground where we could kick them up and watch them fall again. 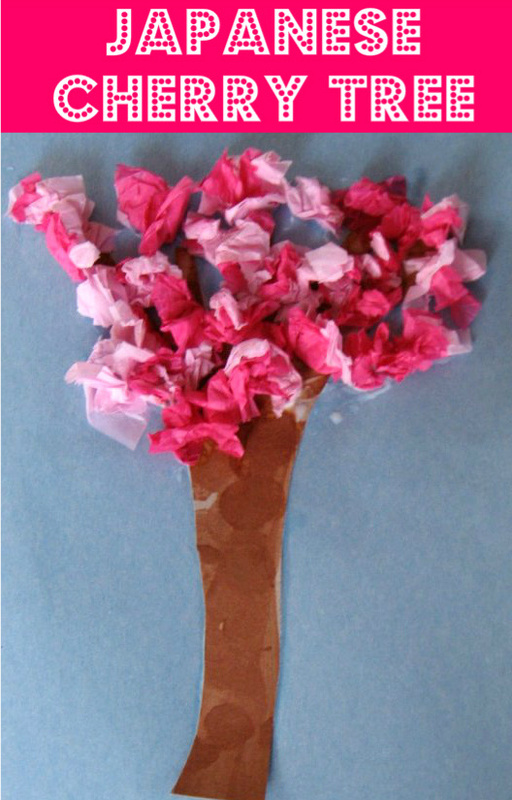 In our neighborhood, the trees are starting to bloom and after a long walk past many “pink trees” we came home to make this cherry tree craft. Gather your materials. 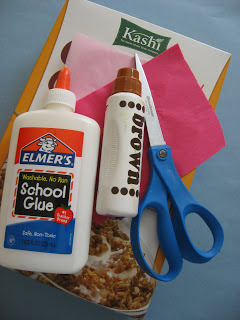 You’ll need some cardboard (if I did this again I would use a paper bag instead of a glossy cereal box, it was hard to glue), 2 shades of pink tissue paper, scissors, glue, brown paint, and a sheet of blue construction paper. 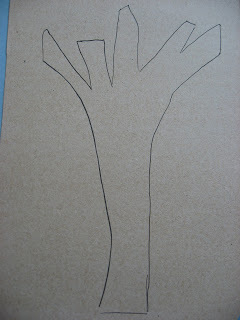 Start by drawing a bare tree on the cardboard. Next, have your child paint the tree brown. Crayons or markers would work great too. 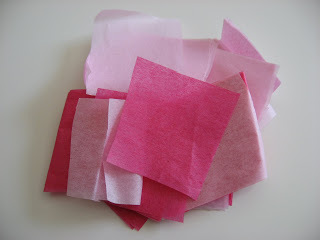 While they paint, cut the tissue paper into small squares. 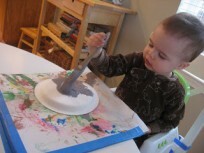 Let the paint dry and hand your child the tissue paper square to crumple. Be warned that for days after my son has asked to crumple many many things around the house. 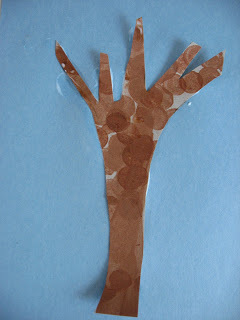 Cut the tree out and glue onto the construction paper. I had to hold down the cardboard for a few seconds because of the glossy side not wanting to glue. 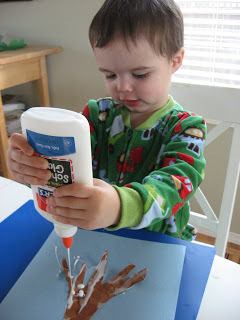 Add glue to the tree top. I flipped it upside down for my son so it was easier to reach. Add the blossoms! Whether you add a few or many it will look beautiful! 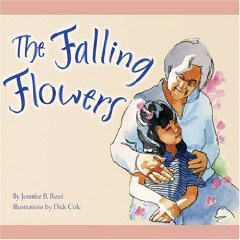 “The Falling Flowers” by Jennifer B. Reed is the perfect book for this craft! I was a little too loud when I found it at the library, my son told me to shhh! The story is very sweet, it’s about a grandmother taking her young granddaughter on a surprise outing in Tokyo. It turns out that she is taking her to see the cherry trees in full bloom just as her grandmother had done with her. 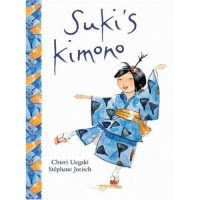 “Suki’s Kimono” by Chieri Uegaki has been on my shelf for years. I really really like this book, the message is fantastic! Suki loves her Kimono, she doesn’t care that her sisters think it’s not cool to wear it to school, her grandma gave it to her and she likes it. I love that she is depicted as confident but not 100% sure of herself, it allows readers to really connect, recognizing those times when we are putting up a brave face even if inside we aren’t so sure. It’s a lovely book! Next Post: Peek-a-Boo Eggs Sent In By You – Re Made By Us ! Previous Post: Basics for Beginners ! Very nice. Very springy. 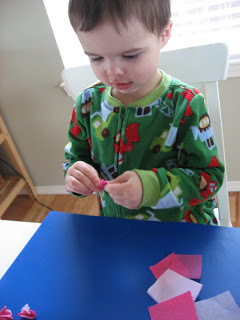 We made flags using this technique. The kids had a ton of fun. I love these trees. Great project, I think I’ll save it for when we see them bloom here. Today we made a rainbow cat. I love what kids come up with. What are those little paint, dotty things called? and where did you find them? My mother-in-law has them and my daughter loves them. Your projects make me want to get some! I am using your website to start learning letters with my 2 year old. Thanks for sharing all of your creativity!! They are called Do-A-Dot Art Dobbers. I got them at Micheal’s , make sure you have a 40% off coupon they are pricey but last a long time! Love this! I will have to do this with my almost-3-yr-old. We live in Macon, GA, home to over 300,000 cherry trees, all in bloom right now. So beautiful! Thanks for this wonderful idea! 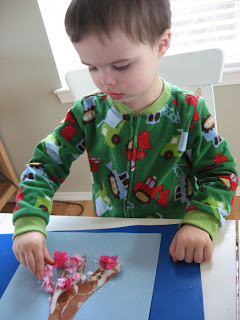 I just love your blog and check it every day for fun projects to do with my little guy! We are taking my girls to Washington DC in two weeks to see the Cherry Blossoms so we will be certainly making this project. I just have to decide if it is better to do it before or after our trip. PS – you can also get the dot markers somewhat cheaper at CVS (or other similar stores – CVS has store-brand ones), sold as bingo markers. 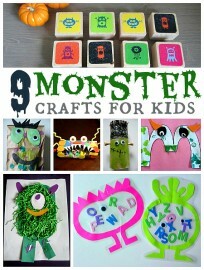 What a wonderful idea to do with my 3 year old! He has the same truck pjs as your son! 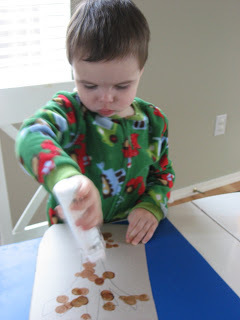 very cute idea!I need to get my son some of those dot markers. Pretty! I also have a 2yr old and didn’t realize that she was old enough to crumble and glue tissue on like that. Can’t wait to try it with her. About the paint daubers – I have the Do-A-Dot brand also, but find them hard to wash off. Guess I got spoiled with the Crayola markers that come clean w/ just a baby wipe. They are also called bingo daubers, and I saw some at Dollar Tree yesterday. Love this. My daughter really likes crafting and I can’t wait to see her blossoms. I just found your site and I love it! Thanks for all the great ideas! !